"Share the experience and flavors of Prescotts with family and friends"
Welcome to Prescotts Grill. 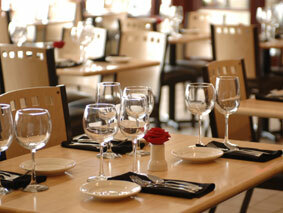 We are thrilled to have the opportunity to serve you at our fine dining restaurant in Rochester MN. Eat local, buy local, be local. We invite you to dine with us and experience food as it was meant to be experienced: fresh, fragrant & full of flavor. All of our meals are prepared by our award-winning Certified Executive Chef, Christopher Rohe, using only the finest ingredients. His passion for savory food is reflected in every soup, salad & entrée he creates . . . and in every bite you take. In addition to our exquisite, tantalizing menu, we have an excellent selection of wines for you to choose from, all of which you can enjoy in an intriguing and relaxing atmosphere. We offer a wide variety of great wines for your dining pleasure! Chicken Breast stuffed with Dungeness Crab Meat topped with a rich cream sauce served with vegetable rice.